“I do know Betsy DeVos, I have great respect for her,” Rauner said Thursday. La expresidenta del Partido Republicano en Michigan, Betsy DeVos, fue elegida por Donald Trump para dirigir la Secretaría de Educación. Gov. Bruce Rauner praised President-elect Donald Trump’s pick for education secretary Thursday, calling the Michigan billionaire and school voucher advocate “a very talented and very passionate education advocate,” the Chicago Tribune reports. 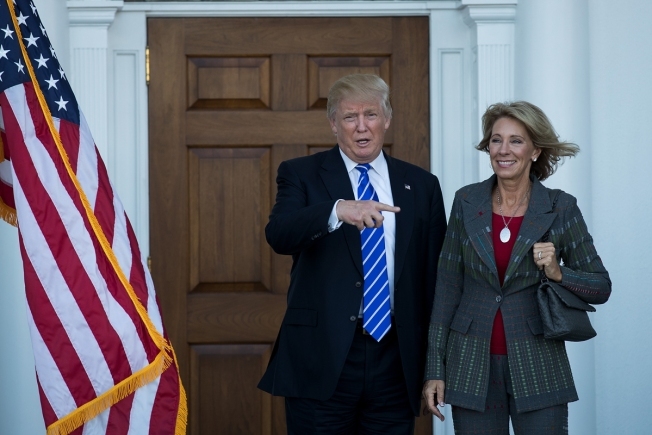 Trump named Betsy DeVos the head of the federal Department of Education last month. DeVos has been a visible proponent of voucher programs that allow parents to use taxpayer money to pay for private or parochial schools, according to the report. Devos, whose husband is an heir to the Amway fortune, was a former chair of the Michigan Republican Party. “I do know Betsy DeVos, I have great respect for her,” Rauner said Thursday. “I think she’s a very talented and very passionate education advocate. And I personally believe in school choice. And I look forward to working together." The DeVos family, who are among the country’s top Republican donors, contributed $13,000 to the governor’s 2014 campaign, according to the Tribune. That includes a $1,000 donation from DeVos herself. Earlier this month, Chicago Teachers Union President Karen Lewis slammed Devos, warning that she would expand on policies that have “been proven not to work,” according to a separate Tribune report. Lewis has repeatedly clashed with Rauner during his first term in office, even calling him a “new ISIS recruit” in April after the governor slashed millions in funding for the district and other social service groups. “Has Homeland Security checked this man out yet,” Lewis asked as the time. “Because the things he’s doing look like acts of terror on poor and working class people."